1) User's code completetion, when I can enter my small piecies of code and this code will be autocompleted in editor. 3) In tab of opened I want to show Selected file more discerned, like BOLD for example, as I can hardly to define current tab. 4) Can I make common layout not so dark? For example in search In project dialog I can hardly see entered text on dark background. 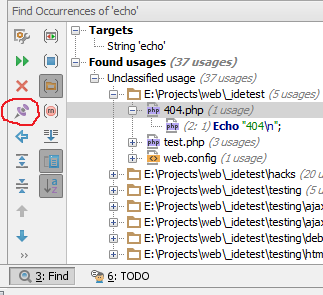 5) If is there way In search In Project to exclude some directories from search? 6) Is there function to make indenting current page to current indent options? 7) How to set Hot key to close current page? If there Search By key on help page http://www.jetbrains.com/phpstorm/webhelp/getting-help.html ? I would like to make search like "Bookmars", but I did not found such function. 4) Sorry, don't know what you are talking about without a screenshot that would illustrate the problem. But generally speaking: try different UI theme (Settings | Appearance); GUI theme color is NOT tweakable (it's hardcoded in theme). 7) Settings | Keymap (make copy of any bundled first and then you can customize any key) -- it has search functionality to help you find correct action faster. But clicking Ctrl+J in the editor or entering in editoor "deb" I do not see this "deb" item but see all the rest items from this list(as on prinscreen). You forgot to define the context (in what languages this template can be used) -- click on blue "Define" link and check appropriate context(s). Also, tell me please I did not found menu/functionality "Rename File", having Opened file or selecting it in left files list. Also if there is a way to select some function and to get extented help, like opening browser ex http://ua2.php.net/manual/ru/function.uasort.php ? "View | External Documentation" (while standing on such function/variable/class/etc) does exactly as name suggests. It is available only if quick documentation (View | Quick Documentation) for it has @link tag with valid URL. In case if such URL is not present (but it should be present for all standard functions), use "External Documentation" (or click on icon with arrow up) from within that Quick Documentation window -- it will execute search on php.net site. I suggest exploring main menu a bit and check "Help | Default Keymap Reference". "Hep | Find Action" is also very useful if don't know exact location of command. After search in project box with found files is opened. Can I to copy to clipboard path of file without opeing it in editor? 2) Are only results of current search visible? Can I view results of prior searches? 3) Can I to make autocomplete to work for special html symbols(like) in html page ? 4) Opening new page can I to open it at end of editor(I mean it must be last page from left to right )? 1) After search in project box with found files is opened. Can I to copy to clipboard path of file without opeing it in editor? "Project box"? -- Not sure what exactly you mean by this. Do you mean "Find" tool window with search results (see image below)? In any case -- you can use "Edit | Copy Path" -- can be used from other locations as well.